Earlier this year, Jarrell “Big Baby” Miller confronted WBA/IBF/WBO/IBO Heavyweight Champion Anthony Joshua on the stage of a press conference announcing DAZN’s US launch. While Joshua simply walked away from the matter, Miller feels he may have gotten to the heavyweight champ. And with a win against Tomasz Adamek on Oct. 6, Miller will be one step closer to the title shot he desires. And Miller promises his mind games and aggressiveness against Joshua will not end anytime soon. Joshua’s promoter, Eddie Hearn, recently admitted Miller could be in prime position with a win, as it could set Miller up to possibly claim the WBA “Regular” Heavyweight Title. Hearn envisions a possible Joshua-Miller fight next year. 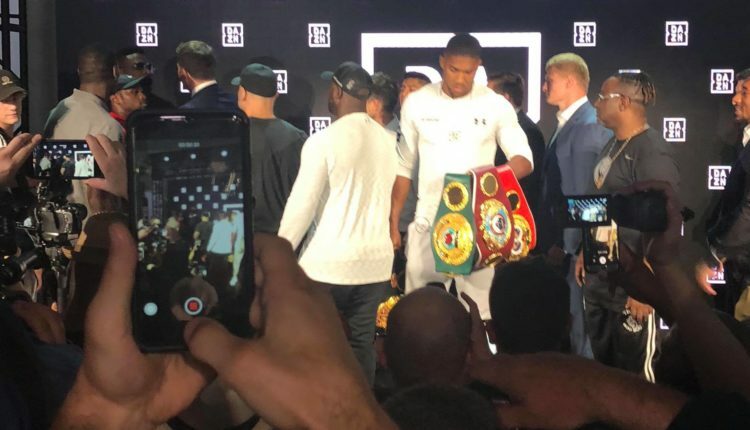 “I smelled fear [from Joshua at the DAZN confrontation]. He’s been protected all the time,” Miller said. “They gave him the Olympics, they gave him easy fights. It’s another thing when you have someone who had to earn and strive for everything. That’s me. I’m an animal. I’m a nice guy but I’m going for his neck. I’m going for the jugular. I smell it on him — he sees somebody who’s not afraid. Every time I see him, I will bully him.